Today's photo is another shot taken by Harold Booth in 1934, and kindly forwarded to me by Derek Legg. 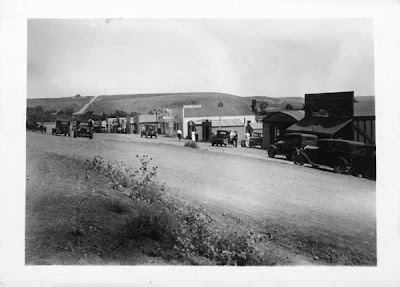 The back of the photo is labeled "Main Street, New Deal, Mont." The community of New Deal was a ramshackle little boomtown that developed in 1934 in conjunction with the construction of Fort Peck Dam. It was a busy place for a few years, but quickly faded away in the 1940s after the dam was completed and its construction workers moved on. There's almost nothing left there today. This is a great photo, and if you can look closely you can see lots of detail in addition to the old cars that first draw you in ... like the American flag waving in front of the store on the right. Studying the original image with a magnifying glass, I can report that the sign on the roof of the center building reads, "HARDWARE," and that the building just to the left of it is a General Store.